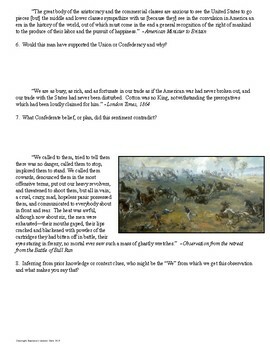 Students read 11 quotes about different aspects of the American Civil War, analyze 6 images, and respond to up to 19 questions. This would be great for a sub and the answers are included where appropriate. See the preview for a closer look! 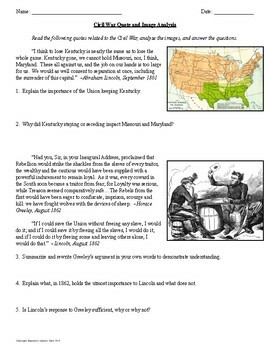 --Why did Kentucky staying or seceding impact Missouri and Maryland? 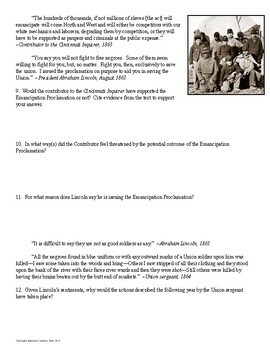 --Is Lincoln’s response to Greeley sufficient, why or why not? 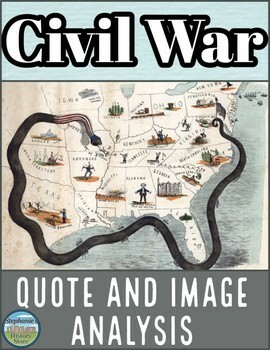 --Would this man have supported the Union or Confederacy and why? --In what way(s) did the Contributor feel threatened by the potential outcome of the Emancipation Proclamation? --Given Lincoln’s sentiments, why would the actions described the following year by the Union sergeant have taken place? --Re-write Stevens’ sentiments in your own words to demonstrate understanding. Consider the bundle to save!! !